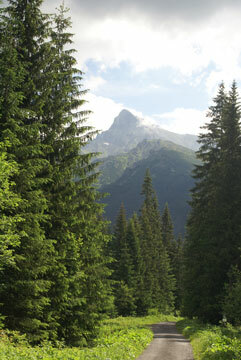 The Tatra is devided in three mountain ranges: the Western Tatra, the Low Tatra and the High Tatra. 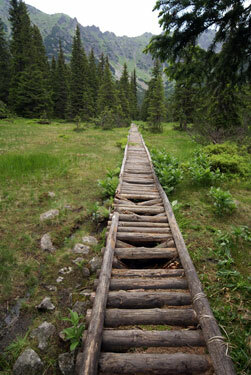 The walked three days in both the High and Low Tatra. 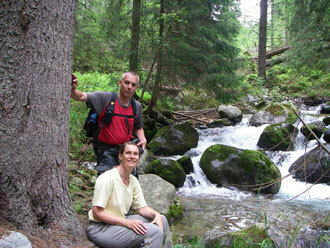 We started with a walk in the hills at the foot of the Tatra. Leon was reminded of Windows when seeing this view, and he just had to make a picture. 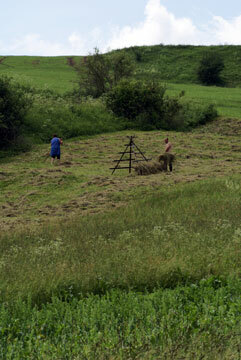 On this first day we met several people, like some farmers putting hay on a wooden carcass so it will dry. 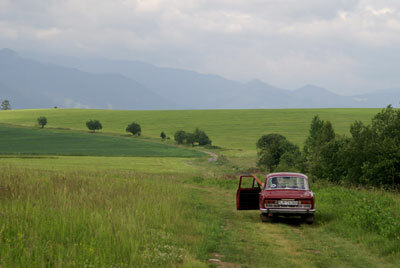 The man with the old Skoda is waiting for his son, who disappeared with a basket in the wood. Probably to pick mushrooms? And several shepherds with a large flock of sheep. 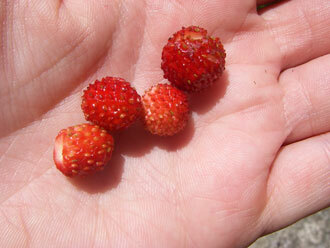 We enjoyed the weather, the flowers in the fields and the strawberries in the forest. The boy couldn't be picking those, as they would fall through the mazes of the basket. 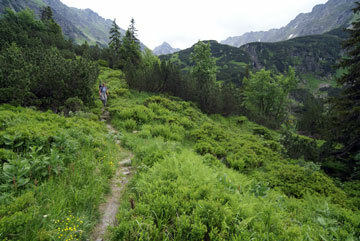 The second day we followed the Magisterial Path, which leads along the foot of the Tatra. 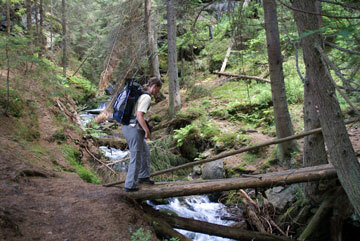 We walk through the pine woods and cross small streams. 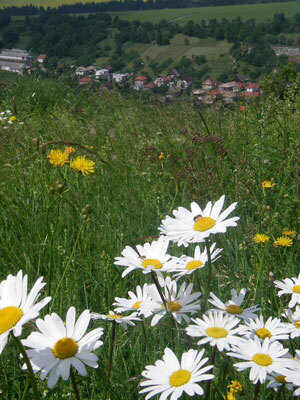 Sometimes we have a view over the hills where we walked yesterday, and at the mountains of the Low Tatra. We are not the only tourists here. 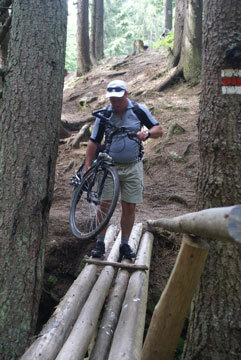 There is a large group mountain bikers. The bridge is not the only obstacle for them (and us). Sometimes a tree is fallen over the path, and usually you have to climb over it. Nice with a bike! On the third day we really go into the mountains. 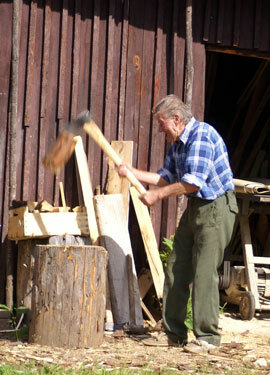 Unfortunately, the first kilometres are quite boring, on a asphalt road with large pine trees on both sides. Only occasionally you get a sight of the nearby river or the mountaintops. We decided we would have done better if we had rented some bikes for this track, 8 kilometres to a waterfall and in the afternoon back again. 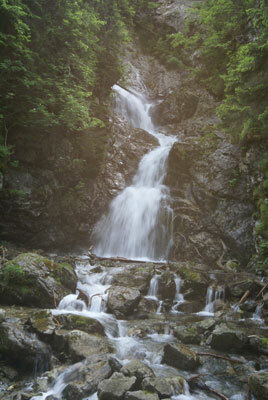 The waterfall is the highest one of Slovakia, 80 meters. From here, the way starts to get better. 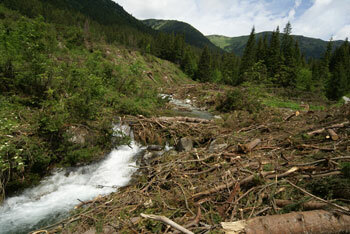 The last bit is in a swamp in a sort of caldera formed by the mountains. We didn't reach the lakes that are about one kilometre further, because a thunder storm approached us. Fortunately, we only got rain and no lightning.